When Ryse: Son of Rome comes to PC this October, it will be sans microtransactions. Ryse: Son of Rome was one of the more interesting Xbox One launch titles, developed by formerly PC-exclusive dev Crytek, and taking place in, as the title would suggest, ancient Rome. However, it left a bit of a bitter taste in gamers mouths when it was announced that the $59.99 game would contain microtransactions. Thankfully, Crytek has announced that the PC version of the game, due out on October 10, will be coming to the platform sans microtransactions. In a tiny little afterthought on the page of PC exclusive features for the game lies the phrase "we have also removed the optional microtransactions that were present on the Xbox One." In addition to not having to shell out cash for armor kit "shortcuts," the PC version will feature all four Ryse DLC packs for no additional charge. Other features players can look forward to for the PC release include 4k resolution support, and vastly more customizable graphical options. Ryse will be a Steam release, and thus will take full advantage of Valve's Steamworks platform, with support for Steam Achievements, Trading Cards, Leaderboards and cloud saving. Other than that, the PC version of Ryse should be identical to the Xbox One version released earlier in the year. Ryse was met with pretty lackluster reviews when it first launched, and it didn't help that Crytek alienated its historic PC fanbase by deciding to go Xbox One exclusive. It's hard to tell if this PC re-release is an olive branch, or a move of desperation. The fact that the DLC is included for free is enough for me to at least give this game the benefit of the doubt. It's not like EA would have done the same. Eh? Cuz everyone was really chomping at the bit for this... Still I might give it a go when its Â£2.99 on Steam. yes, definitely not a first buy, but on a steamsale, maybe. Actually, at this point, I'm sort of doubting any games will stay exclusive on the Xbone if they don't absolutely have to. I do like the fact that if I ever decide to try this, I not only don't need an Xbone but I get a superior version. But I'm not sure I'm going to want to do that. im sorry but i forgot about this game and it doesn't matter if its an olive branch or desperation unless it one answer one question. is it good enough for me to care about it after all this time? Its hard to tell if this PC re-release is an olive branch, a move of desperation. I'll see what it comes down to in the Christmas sale. I honestly don't mind QTE heavy games so long as they're pretty to look at. Sometimes I don't want to play something complex and just want to veg out. When this drops below Â£10 I'll get it and laugh at all my friends who bought Xbones. I'll probably give this one a try. Especially if the pricing is good. It was a big mistake for Crytek not to release this game on the PC at launch, now they can't blame its poor sales on piracy. How embarrassing. I'll probably give this a try, I like this kind of pseudo-historical thing and the co-op could be fun. I am completely indifferent about this game, but I am amused by crytek's actions. PC dev that abandoned PCs because the money's in consoles that comes crawling back to the PC. Did greed not work out? It's too bad that the revelation that being greedy assholes doesn't go over too well came a bit too late. What a shame. The fact that the DLC is included for free is enough for me to at least give this game the benefit of the doubt. I don't know, offering to make a turd into a bigger turd for free isn't an overly enticing prospect to me, it just takes even longer to clear up. Make no mistake, Ryse is a turd. Anyway, with both the PS4 and Xbone being essentially media box PCs I expect this will be the fate of almost all the exclusives for both that aren't made by first party developers. Unless of course the contract includes exclusivity until the year 9999. Well that is expected and weak. What a section of the crowd demands is more than likely a terrible move. Its like...well not in scope (my example is much bigger) of course but lets roll with it, like John Cena finally turning heel like all the IWC want him to. Would that stop them hating him? Nope, as after all instead of FUing the likes of Wyatt, Harper, Rollins, Orton, and so on he'd be FUing Ambrose, Bryan, Reigns, Ziggler, and all the other faces. A wrestling company can work this simple fact out, why can't the supposedly smart Crytek? Anyway this is "good" news for me I suppose. 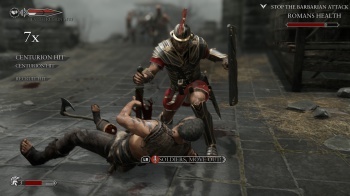 If I ever take a blow to the head and want to play Ryse: Son of Rome of all things than I can on my PC. Way too busy for the next couple of years though as I have a heavy stockpile of exclusives to play, and more are coming. Though I was never interested in this game to begin with and probably won't be getting it now, I do hope they get a good enough amount of money from it to show that we appreciate games with no microtransactions. The only thing that might save this game is modding, and it would take a major mod to make the game into something fun. The world's something I'd like to explore, and a mod that says "screw the story, go roam around in Rome and its provinces" is the sort of thing this game needed. Isn't this the one where Queen Boudica of the Iceni invades Rome with an army of war elephants? True...but unfortunately the way these people work is that if we don't reward them for NOT hitting us with the big stick, they will assume that they problem never was the big stick and they'll just break out an even bigger and badder stick next time around. And we will never again see games from them that don't include people hitting us with big sticks. Once again, the PC crowd is left deprived of the real next-gen experience. I mean, no microtransactions? Come on, Crytek, what's with the discrimination? My philosophy is that there will always be people who are decent enough to already know not to hit people with sticks, and they're the ones we need to be rewarding so they can continue to thrive, not to mention the ones who deserve it the most. Everyone else can go get fucked.